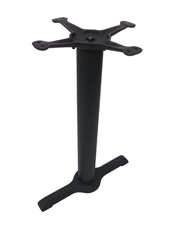 The JI3-522TP12 is our most popular two-prong table base. Using two per table top, this end base is a cost effective solution for supporting longer rectangular table tops. The two-prong design provides excellent support while minimizing interference with customer's feet. Upgrading to a 17" top plate (TP17) will provide added support for wider and longer tops. See Size Chart below for recommendations.